Yolanda is conflicted. Her sister Elf has battled depression for her whole adult life, and is in a psychiatric ward under permanent observation after attempting suicide - again. Yolanda has always looked up to Elf as her talented and beautiful older sister. She loves her with a fierce passion and wants to believe in the possibility of a future together, one in which Elf gets better. But it's looking unlikely and Yolanda has to decide; if the person you love is tired of living, is it kinder just to let them go? 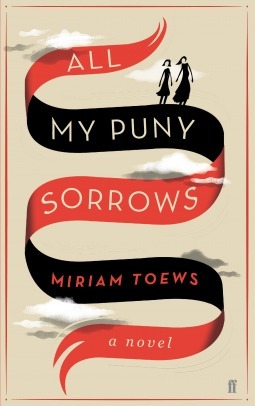 All My Puny Sorrows (a line from a Coleridge poem) is written out of Miriam Toews's personal experience and is, in some ways, a grown-up version of A Complicated Kindness, the novel that catapulted Toews to her bestselling status in Canada. This story allows Toews's beguiling narrative voice - her easy, snappy, darkly comic intimacy - to sing through. Books have been known to make me sad or angry, but very few got a tear out of me. Fewer still left me empty and lonely in the company of loved ones. Let me explain. I read All My Puny Sorrows during family holidays: I read it in the airplane, in the car, while waiting for food at the mall, in the supermarket, in stolen moments of silence, while family chattered around me. As any reader knows, it can be difficult and annoying to read in such circumstances, when your name is called every other page for this or that. I was too distraught to notice. I'd look up from the page, unattached to reality, answer, and get back to the book. When I finished the novel in the car after a quick meal, the emptiness lingered, tears stung in my eyes. Even the beautiful greens of the island seemed bleak. Yet, as the story sunk in, I found myself smiling. The compulsion to cry lingered, but the colours were brighter. It's that kind of book. All My Puny Sorrows isn't a Greek tragedy. It may deal with death, depression, suicide, broken families, unfulfilled expectations, and patriarchy, but is not all about the darkness in life. It has familial love, acceptance, resilience, and humour. Oh, so much humour. Toews does not keep it a secret that the story is at least partially autobiographical. This may explain the fantastic grasp she has on the subject matter. She perfectly depicts the wish and horrors of death and the despair and ridicule of life. She doesn't point fingers at one side of this "debate", but explains each of them so well one can't help but wholly sympathise. Yet, in laying out the recriminations often spoken to the depressed and suicidal (e.g. selfishness), she debunks them one by one so the reader can see none of them are true. There are no moral accusations. The issues are laid out as they are, as facts that bring feeling, and nothing more. It may hurt, but it's the way it is and there's no point in denying the facts. All that's left to do is to choose where to step: to pay the bills, not to drown in the flood, to keep a family together, not to lose a sister, to move forward. The characters, the paths they take, and the relationships between them are nothing short of beautiful, some devastatingly so. All My Puny Sorrows is a book populated primarily by women: daughters, mothers, sisters, aunts, grandmothers, friends, teenagers, adults, elders, divorcees, married, single, pianists, writers, dancers, etc, etc. I could go on, but you probably got the picture by now. All characters are vastly different, yet the friendship between them is unwavering. They are together through thick and thin, and weather every storm hand in hand, without judgement. What's more, this is the first book I've read where a woman feels guilty for having had many a lover in her life (sometimes simultaneously), and the women around her shake their heads and tell her there is nothing to be ashamed of, that happiness is what matters. All My Puny Sorrows is a remarkable story, one of the best I've read this year - no, in my whole life. It is raw with emotion and full of laughter. It has plenty of food for thought (a true banquet, I'd say), and even more of hope. Because in the end, hope is all we have.